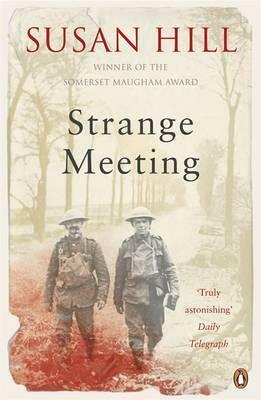 In her Afterword to this book, Susan Hill says that it owes nothing more than its title to Wilfred Owen’s poem of the same name, She acknowledges the coincidence thread which led her to write this novel as a means of putting to bed, of exorcising her ghosts, as regards WW1. As a child she had learnt that her own grandmother’s only brother, Sidney Owen, killed at the Battle of the Somme; his name provided the link to the famous but unrelated poet; and later she was to discover Benjamin Britten’s work and Owen Wyngrave the hero of the Henry James short story about whom he wrote his opera. This Owen – Wyngrave circle was furthered when she sat down in Aldeburgh to write this novel, during a winter in which writing was broken up by “walks on the marshes and shingle in the bitter cold, breathing in the inspiration of Britten with the north wind”. Once again, my reading has taken me to a book where the plot is subservient to emotional and physical landscape and character. Certainly the landscape plays a part in her novel, she describes the devastation and horrors of the trenches, of trench life, of non man’s land, but the core of the book is the relationship between two officers – David Barton and John Hilliard. Flung together as room mates in the small loft of the farmhouse serving as Battalion HQ when John returns to France after a spell at home, the two men are very different. Hilliard is reserved, introverted, from a family where show is everything; Barton is not only talkative but open and sharing of his thoughts and feelings, able to get on with everyone. Through David’s letters to and from his family, John begins to see a whole new world and way of life. There are some strange memorable moments in the story: for example the tale of how the men in the trenches adopted, cared for, and turned on the hedgehog; how Barton madly rushed out into no man’s land to retrieve it but could not assist and left his fellow comrade to die in the field; the moment when their CO, having sealed the end to his career by speaking out against the continued orders from on high for reconnaissance raids which he thinks “are pointless in terms of strategy and a criminal waste of men” address his officers for the last time – a turning point for him, for them, their lives and for their war. It is not only David’s letters which are interspersed through the novel – Hill says she read a great many memoirs, diaries and letters as part of her research – but also the arrival of Hilliard's parcels from home. Whereas David’s letters are like him, open, honest, truthful and has family’s letters similarly full of feeling, love and warmth, John’s letters, when they do come, are formal, fuelled by the false ideas circulating at home about how well the war is going and the parcels, inevitably from Fortnum’s are packed full of luxurious goods, glazed cherries and chestnuts, which again serve to show up the contrast between the apparent progression of the war and the actuality on the ground – another reminder of how the military hierarchy were struggling to deal with the anarchic novelty of trench warfare compared to the previously usual, structured, decisive cavalry type battles. As the anniversary of The Great War approaches as I write this on January 1st 2014, I am moved to remember that in 100 years we have still not changed, we still send off our young to fight in battles on distant shores, and to lay down their lives to different weapons, used in different styles of conflict, but all with a similarity of aim, in pursuit of what we see as freedom. ashramblings verdict: 4* There’s no dark or ghostly episode in this novel, just the all pervasive background gloom, but Hill’s writing pulls these two men from the page and this reader became utterly engrossed in them and how friendship is sewn in the most unlikeliest of places between such opposites.